It’s wise to collect a security deposit from renters, which can help you protect against property damage to your rental unit. However, if you don’t know the security deposit return procedures, you risk running afoul of rental deposit rights laws. Nonrefundable deposits are allowed. Even if you want to take a nonrefundable deposit to charge for keys or protect against pet damage, this is illegal. Legally, a security deposit agreement can only withhold funds to cover unpaid rent, unpaid bills, property damage, permitting fees (i.e., for a parking spot), or other use cases set forth in the lease agreement). In other words, if you are going to withhold security deposit funds, then it can only be for one of these reasons. If your tenant caused damage in excess of the security deposit, you’re out of luck. 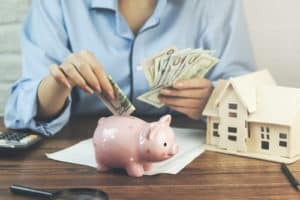 Technically, for landlord rights, security deposit funds can be supplemented if they aren’t enough to cover the cost of a repair by sending a bill to the tenant. Thus, if your renter caused $2,000 worth of damage but your security deposit was only $1,700, you can send the renter a bill for $300. Even though you can seek reimbursement, you may find it difficult to get this money from renters. If the renter doesn’t pay, you may need to take him or her to small claims court. Still, it can provide peace of mind to know you have a valid option. You can deduct normal wear and tear. You cannot deduct normal wear and tear, such as daily wear to the carpet in a rental. You may charge a renter for steam cleaning if this was due to damage caused by the tenant. For example, if you noticed a red wine stain on the carpet, you can deduct the cost of cleaning this from the rental security deposit, since the spill was not “normal wear and tear.” If you’re deducting from the security deposit, provide an itemized list of the deductions and cost to repair. This serves as proof that you were within your rights to deduct, in case an unhappy renter decides to sue. Security deposits are intended to protect your property from accidental or willful damage, as well as guard against unpaid rent or utilities. They are not a way for you to use a renter’s money for unit upkeep or normal apartment wear and tear. In some states you have 20 days to return the security deposit, while in others, you have 30 or 60 days. Some states require you to place security deposits in an interest-bearing account. If you placed the security deposit in your bank account, you could lose the right to withhold anything. It’s always smart to check the local laws in your state or city for specific security deposit agreement procedures. Once you know you’re doing everything right, update your security deposit forms to reflect the law. This way, you are ready to welcome the next tenant. American Apartment Owners Association provides low-cost, customizable forms for landlords including a security deposit form. To get your form and enjoy other landlord perks, become a member today.